We begin our journey as we board our plane to Mexico City, Mexico. Upon arrival, we are met by our friendly PATHFINDERS Tour Manager who assists us with baggage and the transfer to our hotel. En route, we enjoy a panoramic sightseeing tour of Mexico City. The rest of the day is free to explore on our own. Overnight in Mexico City. 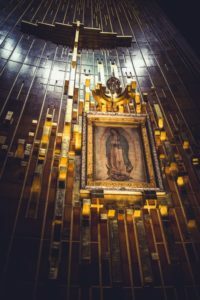 Today our journey begins as we visit the Shrine of Our Lady of Guadalupe. 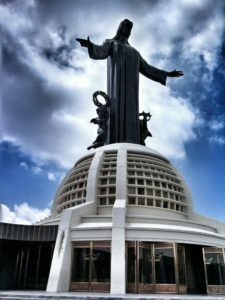 We tour this sacred ground and chapels before we climb the “Cerrito de Tepeyac” to visit the “Capilla del Cerrito. "We then make our way to the Old Basilica for time in adoration. Our final stop for the day is Tulpetlac Church. Dinner and overnight in Mexico City. We continue our journey today by visiting The Shrine of San Miguel del Milagro, Our Lady of Ocotlán and the Chapel of Our Lady of The Rosary. This afternoon enjoy ample time at leisure, visiting the markets to see the famous Talavera’ tiles. Dinner and overnight in Mexico City. 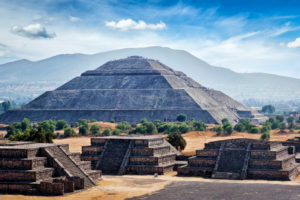 We journey today to Teotihuacan to visit the ancient Pyramids of the Sun and Moon, and the Temple of Quetzalcoatl. We then experience Mexico City including Zocala, the Metropolitan Cathedral, National Palace, Templo Mayor, and Alameda Park. This evening enjoy time at your leisure. Overnight in Mexico City. Today our journey takes us to “Divina Infantita Maria”. 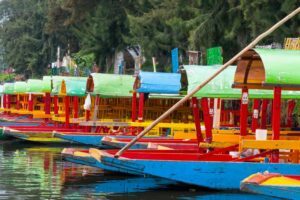 After time in prayer, we make our way to Xochimilco, the “Mexican Venice," enjoying a ride in a “Trajinera” while taking in the sites and sounds. Upon our return to Mexico City we enjoy dinner before experiencing the Ballet Folklorico of Amelia Hernandez. Dinner and overnight in Mexico City. Today we leave Mexico City and journey to Guanajuato. Upon arrival, we enjoy a tour of the city including the Mina de la Valeciana and the Basilica of Our Lady of Guanajuato. After dinner enjoy the city at your leisure or on an optional “Estudiantina” walk through the streets of the city. Dinner and overnight in Guanajuato. We journey today to Leon where we tour the city and visit the Christo Rey Shrine, the Chapel of the Martyres, the Museum of Sacred Art, and the Cathedral Basilica de Leon. 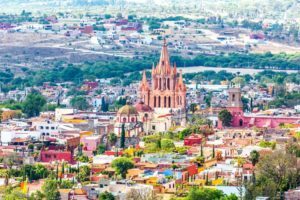 Dinner and overnight in Guanajuato..
Our last full day takes us to San Miguel del Allende where we visit the La Parroquia de San Miguel Arcángel and Centro Cultural El Nigromante. After an afternoon of leisure and reflection time we return to Guanajuato for our farewell dinner. Overnight in Guanajuato. This morning we transfer to the Guanajuato/Leon airport for our flight home, taking with us wonderful and inspiring memories of our pilgrimage, which will be treasured and relived for the rest of our lives.